Summer can be a hellish time to travel around Japan. 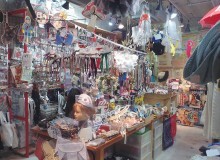 You can duck into every air-conditioned establishment you approach, blow your paycheck on a new Cool Biz wardrobe, or even brave the crowds at hormone-driven beaches like Zushi. But there’s a much classier way to bear the heat, and sunscreen is not required. 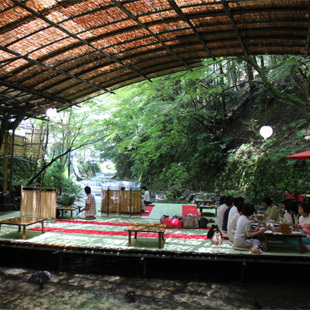 Kawadoko, roughly meaning “place at the river,” is a dining concept which involves eating next to or atop water in order to feel the breeze it supplies. Oftentimes, a series of tiered waterfalls helps this along, providing a scenic and incredibly relaxing way to dine alfresco. 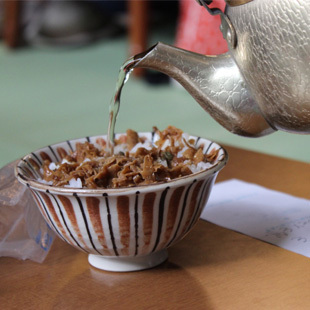 Like many elements of Japanese history, kawadoko established its roots during the Edo Period. Back then, Kyotoans would flock in droves to cold mountain rivers to escape the summer heat with the cool rush of the water providing some comfort from the relentless humidity. 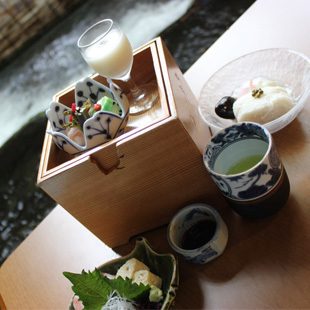 There, tatami rooms were built on top of rivers for patrons to feast on an assortment of kaiseki ryori (traditional Japanese food). This experience was—and still is—a privilege, so many chose to dress up for the occasion, wearing kimono or yukata (summer kimono, made from cotton). These days, kawadoko continues to reign as a seasonal favorite. 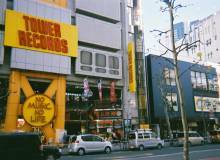 And since Kyoto is the original home of kawadoko, the best places to enjoy it reside in or near the city. Visitors with little time on their agendas can dine next to the ever present Kamo River, running through the heart of Kyoto. However, as lovely as the views are, the somewhat pricey restaurants are still a fair distance from the actual river. For the real deal—as in properly hovering above the water—serious devotees head to Kibune, a small mountain town about an hour’s train ride north of Kyoto. Kibune is a destination in itself, even without the added pleasure of kawadoko. It’s a haven for koiiyo-seekers (fall leaf viewing) who fall over themselves in order to ride the cute two-car train into Kibune, leading passengers through a tunnel of illuminated leaves. Mix in a love-themed shrine, coffee shops, and evening and fireflies, it’s no wonder that this forested retreat sets a perfect stage for kawadoko along its Kibune river. From the bus stop, restaurant after restaurant lines the narrow street leading up to the shrine. You can glimpse some of the restaurants from street level, but most have covered up viewing points with signs warning not to take photos. Case in point: if you want to see kawadoko, you have to pay for the pleasure! But pick wisely—check out their menus and prices before being coerced. Though most sought-after kawadoko experiences require a reservation, many of the restaurants at Kibune beckon unprepared patrons for a simpler, cheaper meal. With no intention of even doing kawadoko, I was seated at noon on a beautiful Sunday—prime time for tourists. My table sat about a meter above the water, so close I could dangle my feet in the frigid water. Surrounding the “restaurant” was tatami matting, separating me from the other kawadoko establishments and shielding customers from the sun above. Slivers of sunlight poked through, though, creating sparkles of dazzling light on the river. The water itself was quietly moving downstream, a dull background noise that was so incredibly soothing it was hard not to just lie down on the tatami and take a post-meal siesta. The food course was about ¥3,000, presented in a stacked ornate bento box. For the price, it was quite satisfying, comprising yuba (tofu skin, the area’s speciality), ochazuke (green tea poured over flavored rice), and local vegetables and pickles. River fish were skewered and fried nearby. Out of everything, the sashimi was the only disappointment, obviously being of lower quality … but that’s to be expected from the price. Honestly, I would’ve been content with a slice of bread, as the scenery was so distracting. Though some people chose to spend their entire afternoon by the river, Kibune has its other treasures. Where else can you receive your omikuji (fortune) by placing a piece of paper in water and watching it magically appear? Kawadoko is a seasonal affair, but definitely one to put on your Kyoto itinerary. 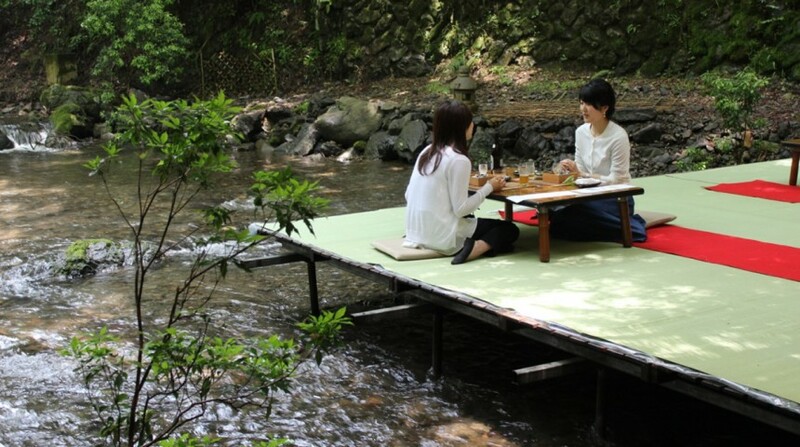 Dining on water may seem like a simple concept, but somehow Japan makes the simple all the more special.